This article has been written by guest author Dani Higginson. Even if you only have a small urban garden the good news is that you can still grow potatoes successfully. The secret is to grow them in pots. 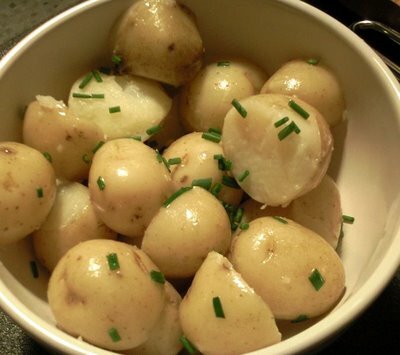 With proper preparation, the right type of container and some TLC, 12 to 16 weeks after planting you can be enjoying some first early potatoes. And there is nothing like the taste of a homegrown potato pulled straight from the ground, gently washed, lightly steamed, and served with lashings of butter. Some good quality seed potatoes of course, and a decent compost mix. Resist the temptation to use garden soil, as you will be growing a large crop of weeds as well as potatoes if you do. Starting from the beginning, you will need some sort of container hold the seed potatoes in order to chit them (grow strong shoots before planting); this is necessary to kick-start the growing process. Recycle some old egg boxes and turn them into chitting trays. Stand a tuber, blunt-end up, in each compartment and store in a cool, light place for about six weeks prior to planting out. Then choose your planting container. Terracotta ones look very nice on a patio, as will the plastic imitation variety; these are lighter and are less prone to frost damage. 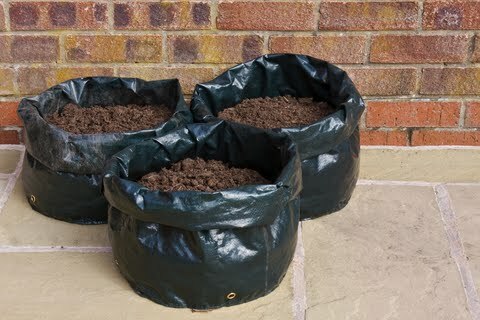 They will also prevent the compost drying out quickly as what will happen with terracotta pots. If you are a keen 'recycler', old dustbins are also ideal for potato growing - as are old fertilizer bags, but watch that they don't overheat! As these types of container are often produced from a dark PVC or plastic, they can easily absorb energy the sun in the form of heat and this will cause the compost inside to dry out far quicker than other types of container. There is an upside to this as the higher temperatures will increase the metabolism of your potato plants, creating a longer and more productive growing season and will also help to increase the size your final crop! Just remember that you will need to make some holes in the bottom for drainage, so that your potato plants do not become waterlogged. Whatever kind of container you choose make sure that it is big enough. Forty liters is a minimum - any smaller and you will be watering endlessly. For this size of pot don't be tempted to plant it with any more than four seed potatoes. ... When you come to plant the tubers make sure that they have at least two good shoots; smaller and weaker shoots can be rubbed off. Half fill the container with potting compost, with some slow-release fertilizer mixed in. Push the tubers gently into the soil with the shoots (the eyes) upwards and cover with 1 to 4 inches of soil. Keep the growing medium moist, and add more soil /fertilizer mix around the plants when they reach around six inches in height to prevent light reaching the developing tubers. It does not matter if the green top is almost covered as it will grow on strongly and will develop more tubers. If light gets to the tubers they will turn green and become inedible. Most of the popular varieties of potato grow well in pots. Earlies are especially good - planted in late March they will be ready for eating in late June. Nothing is better from the garden than those first early potatoes, but they do need protection from frosts in March and April (cover shoots with newspaper if frost is forecast). Arran Pilot is an old variety, but is still one of the best all-rounders. Second earlies take 16 to 17 weeks to mature; Maris Peer is a good one to grow. Main crop potatoes such as Maris Piper and Cara have an 18-week growing time and will take you right through to a late October crop. 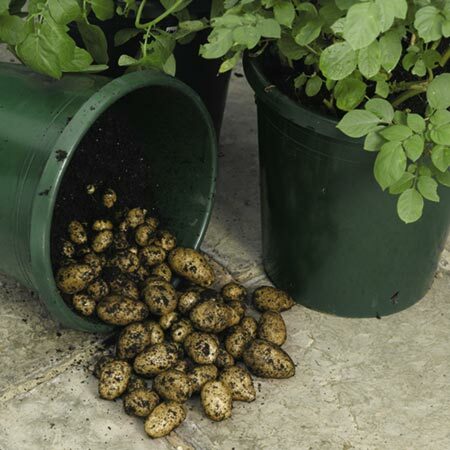 It is quite easy to grow potatoes organically in pots. There is really no need to use any form of chemicals when growing potatoes on this scale. Always buy your potato tubers from a reputable source to eliminate the risk of diseases such as potato blight. Growing some potatoes of your own each year is certainly worth the trouble. Most people stick with first earlies, as the taste of an early crop straight from your own garden cannot be surpassed.